Like any ballet dancer, I’m constantly in need of new pointe shoes. Recently, I walked into our local dance supply store and to my surprise, I not only found a great pair of pointe shoes, but I got a peek into the life of a rising dance professional. I later followed up with Nicole Warren, manager and professional pointe shoe fitter of Dancewear Corner, professional dancer and dance instructor. Make sure to click on the podcast above to hear my complete interview with Nicole as well. I hope you enjoy! From twirling on her toes, to fitting pointe shoes, Nicole Warren’s day is filled with dance. Warren, 26 of Orlando, Florida, started living a dancer’s dream when she was five years old. Unlike most five year olds, she was not dazzled by the tutus and pointe shoes. She dreamed of becoming a ballet teacher and director of a dance studio. Warren kept working towards her goal as a teenager by dancing in competitions, starting in middle school and continuing throughout high school. For some dancers it’s difficult to get into a company right away. It could take weeks, months or even years, but for Warren, it was not that difficult. This time, finding an opportunity was much quicker than before and this time, she found multiple opportunities. 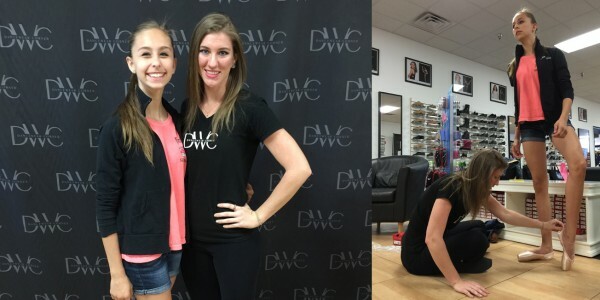 What started out as a simple job at Dancewear Corner (DWC), a national dance supply store, blossomed into two more positions. Connections through the store resulted in a company contract and a teaching position at a local dance school. In addition, Warren’s hard work and dedication escalated her into a management position at DWC. After working at DWC for a short time, Warren got her dream job at a nearby contemporary dance company that performs three to four times a year. With life in a professional dance company, Warren works hard in order to earn her lead roles in the company. In one such case, Warren successfully auditioned and got a featured role in a performance. In this role, she got to be panted and performed with a professional body painter. “It was one of the coolest moments of my life,” Warren reflected. In addition to her jobs at DWC and the contemporary company, Warren teaches at a local dance studio. Warren teaches ballet and contemporary to two to 10 year olds. “I get to be part of their roots of dance,” Warren said humbly and proudly.